Originally published May 1st, 2017. Yep, it sure can. 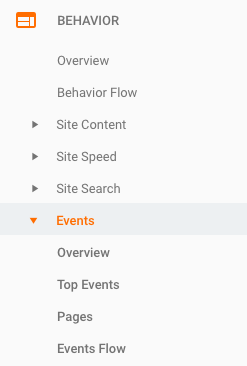 Google Analytics can track link clicks but not without a little customization, first. Let us show you how. Additionally, when setting up event tracking you will be able to add categories, actions, labels to see specific link information or high-level link click information. You are also able to use virtual pageviews to track link clicks however, this technique may cause problems elsewhere. One of the more common problems is skewing content report data. If you track link clicks with virtual pageviews, then your content reports will show more pages on your site than there actually are. There you will be able to view your event categories. Click on the category “Links” and select event label and there you will be able to see the specific links clicked on your website. Additionally, by collecting this data you will be able to create custom segments in Google Analytics to view the behavior of these audience members if needed.